A spicy day in the mountains today during the storm. An impressive amount of snow in a short period of time. The storm was a bit late to start, nonetheless precipitation started at 0600 and proceeded to dump 1-2 inches an hour. 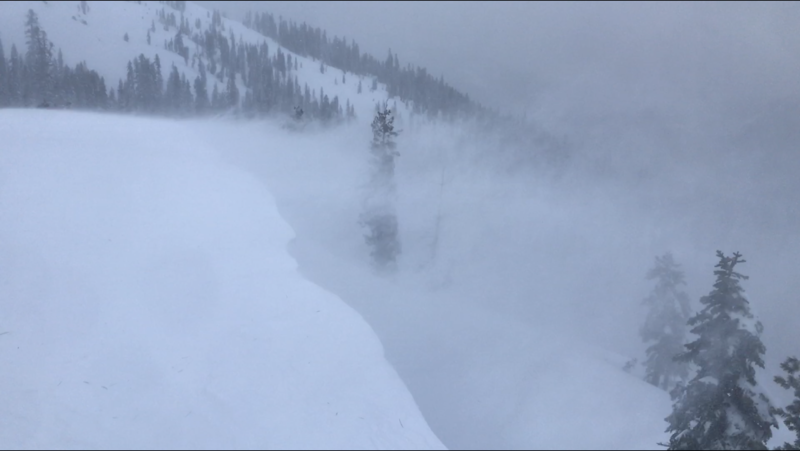 About 8-12 inches of snow fell in a 10 hour period today above 5,500 feet and has been accompanied by relentless SW-W-NW winds. Red flags were observed all over the place in the Cliff and Gumboot Lakes basin area. several D1 storm slabs occurred naturally on northerly facing, mid-slope convexities near treeline. westerly winds blew steady near and above treeline and over the ridgetops, actively loading the right half of the compass. Easterly aspects were most heavily loaded. two feet total of existing and new (4F to F) dry, low density snow exists on top of firmer, melt/freeze rain crust. column tests failed easily on several density changes within soft snow layers, including both 5 and 19 inches down from the surface of the snowpack. If instability anything like today persists, tomorrow will be a day to really play it safe. You don't get to many more red flags than this. Heavy snow for the AM hours, tapering off in the mid to late afternoon, 1-2 inches an hour for a 10 hour period starting at 0600. Wind: Light with moderate gusts below treeline. Near and above treeline, moderate to strong out of the SW-W-NW, averaging 20-30 mi/hr with gusts to 40+ mi/hr. Partial clearing and a glimpse of blue sky late in the day.